Wouldn't that be great? To get together for a cup of coffee (or tea for me!) so we could visit and relax now that the hustle-bustle of the holidays is over? Now don't get me wrong, my family and I had a WONDERFUL Christmas together. But it's been a busy, busy, busy couple of months, and I'm enjoying some time just relaxing now! And I'd like nothing better right now than to get together with a friend or two or three to just chat :). I'm working on writing my thank you notes today. (Yesterday was spent making them up.) And I suddenly remembered that I'd wanted to play along with my friend Pam's Just Punch It challenge. Her Free For All challenge ends tomorrow. So, just because I could, I set things aside to play with paper just for fun to make this card. It was totally therapeutic!! I used two awesome DeNami Design stamps to make this card: a face from the Friendly Faces stamp set and a sentiment from the Let's Get Together stamp set. I also used some clear rhinestones from the DeNami Store and a brand-new 5" x 7" argyle embossing folder that my son gave me for Christmas! He sure knows what his mom likes ;). OK, now that I've had my fun, it's time to get back to work on writing my thank you notes. 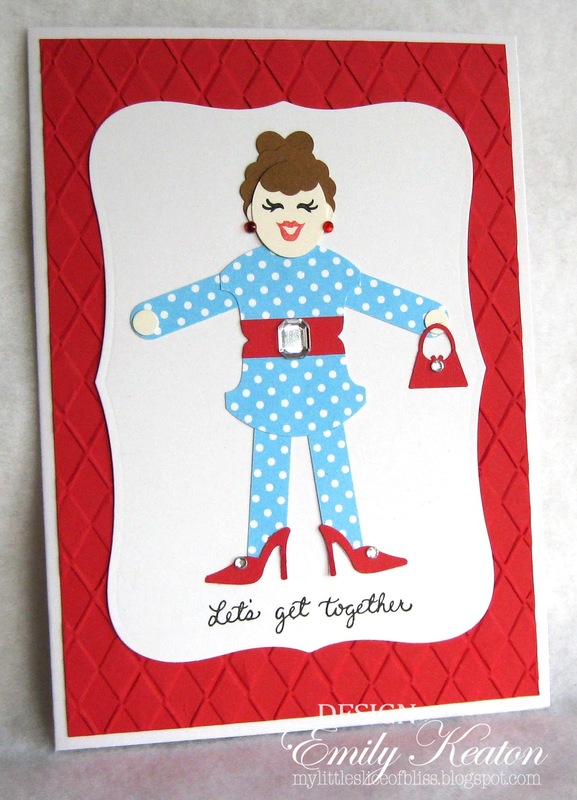 Darling card, Emily! Happy New Year! Girl you are over the top creative! Love it! She is so cute. Love her shoes and purse. She is all ready for her New Years Eve party in her polka dots! Super FUN card using so many punches! So creative and colorful...too CUTE...love it! Sooooo clever, my friend! I stared at this for a while and tried to spy the punchez you used, then read the post supplies and went back again to look some more!